MainAll NewsInside IsraelJewish Home headed for primaries? Jewish Home Central Committee does not approve proposal to choose the party's list for the Knesset by Central Committee members. The Jewish Home Central Committee did not approve on Thursday evening the proposal to elect the party’s list for the next Knesset by members of the Central Committee, and now, according to the party constitution, primaries must be held in which the Jewish Home list will be chosen. 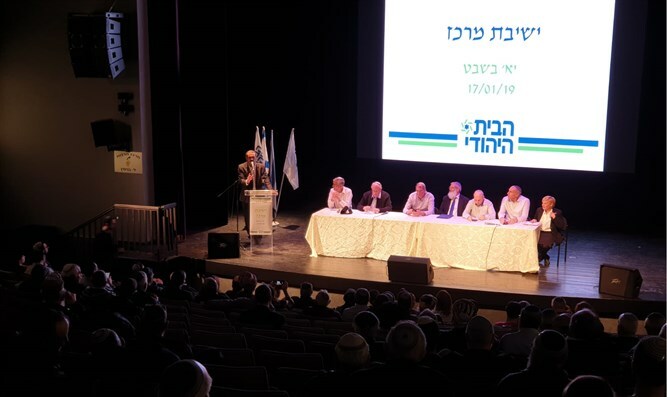 Jewish Home Director General Nir Orbach said following the results of the vote that holding primaries was not feasible and that consultations would be held regarding the next steps. A total of 370 votes were counted. The proposal formulated by the Jewish Home Secretariat was supported by 61% of voters but did not achieve the required majority of 65%. Before the vote, MK Motti Yogev told Arutz Sheva, "We all have a common goal of coming out of here knowing how the chairman and the team of candidates will be chosen. When we have the team and the chairman, I have no doubt that we will go up in the polls and have a large and wide Jewish Home." "At this time, religious Zionism and the Jewish home must be part of the leadership of the State of Israel. I promise that I will not leave the Jewish Home," added the Deputy Minister.